Kaart van Andalusien en Granade. / Royaume D'Andalousie et de Grenade. A stunning map of Andalusia and Grenada, Spain first drawn by Daniel de la Feuille in 1706. Surrounded by thirteen city plans and one city view. From top right in an anti-clockwise fashion these include Malaga, Ecya, Almanza, Cordova, Alcala-Real, Cadix (Cadiz), Gibraltar (view), Sevilla (Seville), Merida, Ayamonte, Anduiar, Granada and Ronda. Title cartouche in the lower right quadrant features four armorial crests representing regional powers. Undecorated Dutch title on left side of the map. This is Paul de la Feuille's 1747 reissue of his father Daniel's 1706 map. Prepared for issue as plate no. 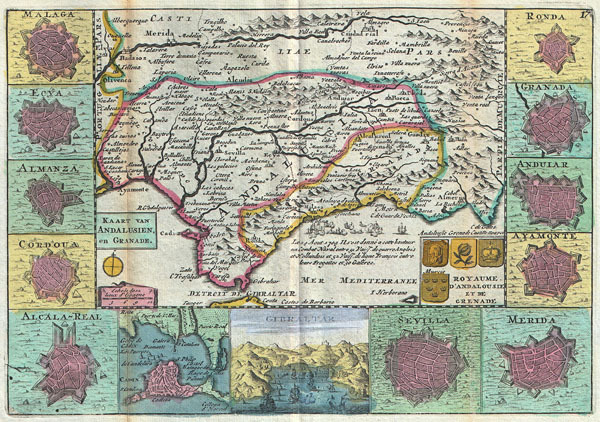 19 in J. Ratelband's 1747 Geographisch-Toneel.